From the muddy banks of the Dee....: What if you held the world in your arms tonight? What if you held the world in your arms tonight? On occasion I can get a little sentimental about the Patch and some of its inhabitants, in particular it's extreme long distance migratory shorebirds. Importantly these birds can also be used as "indicator species" to assess the health of ecosystems and measuring changes to their populations, life history strategies etc can give us pointers to the possible long term effects of things like climate change on us humans. I have been lucky enough to get participate in a couple of research projects in this area and I have a healthy respect for the ecologists involved and science in general. These studies have taken me to the Tagus estuary in Portugal and the far reaches of the Norwegian arctic but the other night I had the chance to help out on a mist netting session just around the corner from my house. 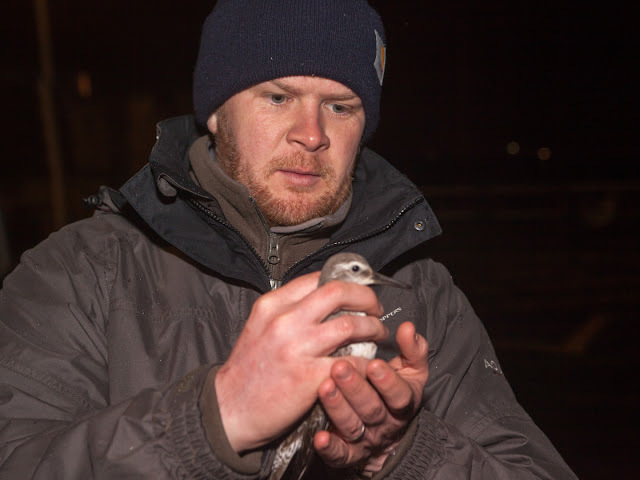 As well as being able to contribute to the study of wader migration I was able to get up close and personal with the birds I spend an awful lot of time watching, birds that inspire me in many ways. 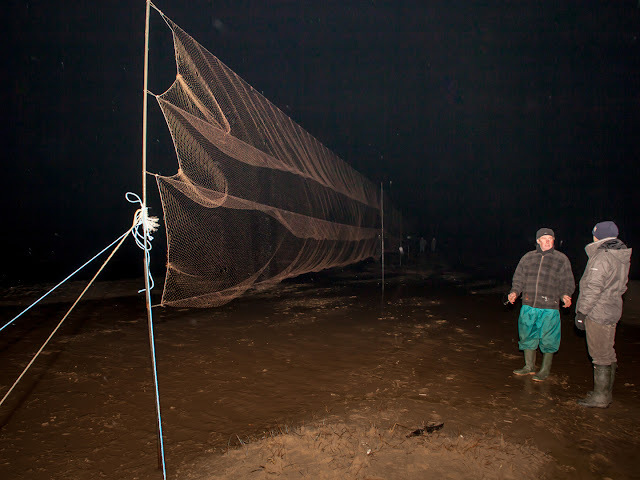 Nets were set with skill and care to maximise the chances of a catch over high water during the night. 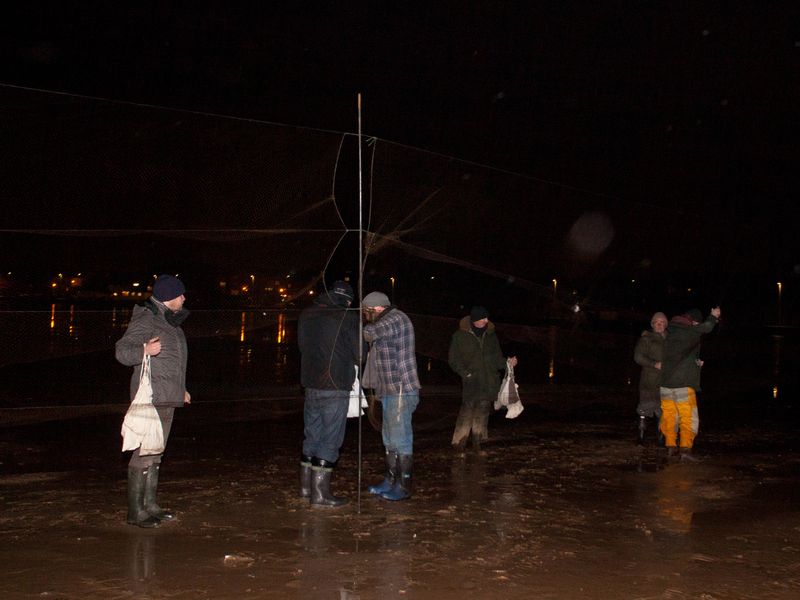 Once the nets were set we waited on the beach for the tide to push the birds towards the nets. We were spaced out along the shore like waterproof and welly clad Anthony Gormley sculptures. The grotty weather in the forecast had failed to materialise and it was quiet on the beach. In the near darkness of the shore I could hear the birds in the distance but could not pick them out. It wasn't until they were really close that I could just make out the flock, it surprised me that they came so close before I saw them. They looked ghostly, formless like a breeze-blown mist when they flew, a hazy swirl of greyish white. It was breath-takingly beautiful. The sound of chirruping calls and wingbeats seemed to be intensified by the night. Sure enough some birds flew up and into the mist nets. As soon as they were in the ringers swung into action, as always the welfare of the birds was paramount. 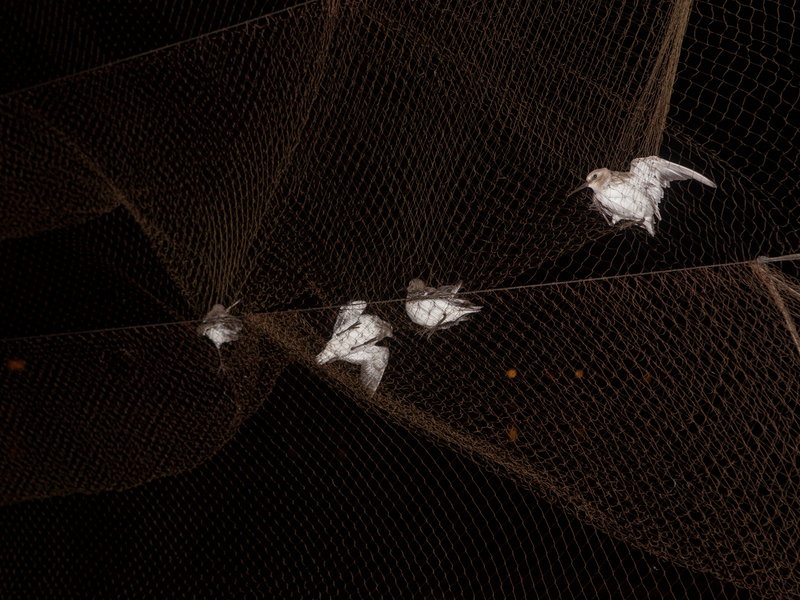 The nets are of a soft, fine mesh so the birds are not injured when they fly into them. They hardly flapped as the ringers extracted then and placed them in bags so they could be transported to the shore for processing. So here I was, up close to the birds that I have such and attraction to. It was an odd feeling. 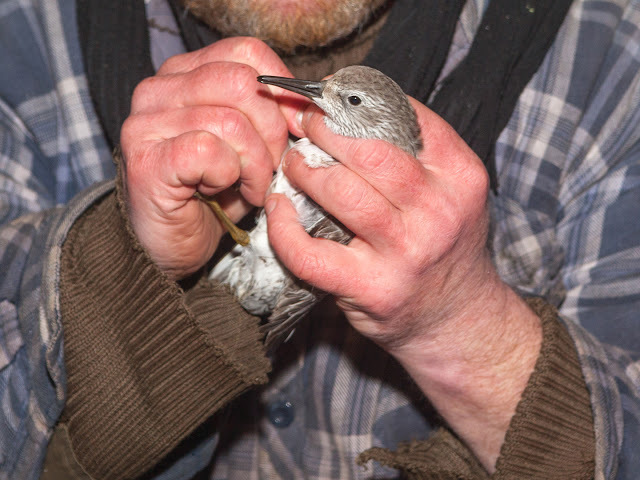 I wanted to concentrate on remembering all of what was about to happen, to help with the science and also to appreciate the birds being in the hand - an opportunity one seldom gets. The guys worked quickly to free the birds from the net and soon we had 60 birds ready to ring. The team returned to the shore with the catch. The birds were put in keeping cages and allowed to relax for a few minutes, allowing the ringers to catch their collective breaths too. Then the birds were carefully aged and before rings were fitted with care and a dexterity that defied the cold winter night. The birds were then relaesed to rejoin the flock that was still defying the tide on the shore. This is where I fitted into the operation. I would be handed a ringed bird to release into the night. 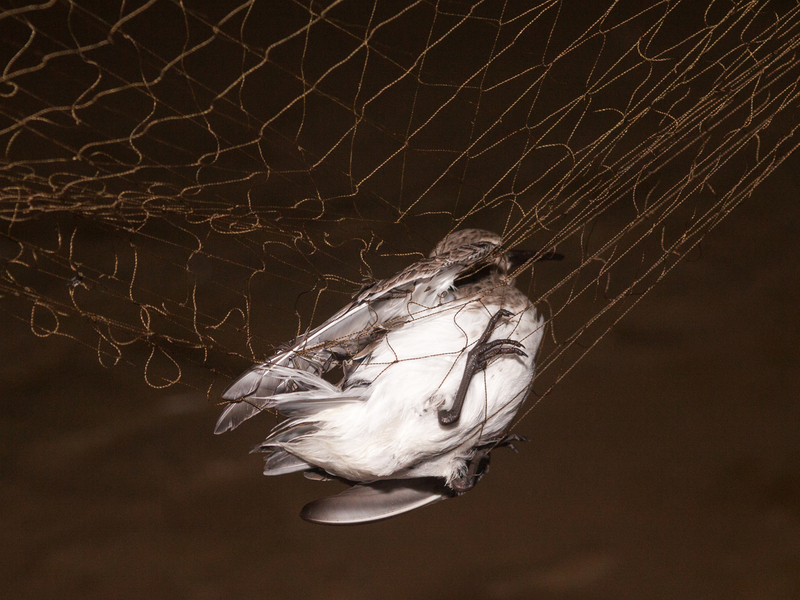 Another Knot is passed to me for release. Like the Dunlin it is really warm, perhaps its just my hands being so cold that makes it seem unusually warm. I look at it in my hands contemplate the miles it has done and will do over the coming weeks. It is a tiny piece of this world. Blood and bones, muscle and feathers all made from bits of our planet, its species ranges over so much of the globe too. I stare at it. The world distilled into a palm sized wading bird. I feel admiration for it, joy at the wonder of the natural world ( a HUGE cliche I know but a cliche is a cliche for a reason), guilt at my own species' effect on our planet and, unexpectedly, envy. I'd like to see Greenland. It seems achingly fragile but tremdously robust too, amazing creatures. 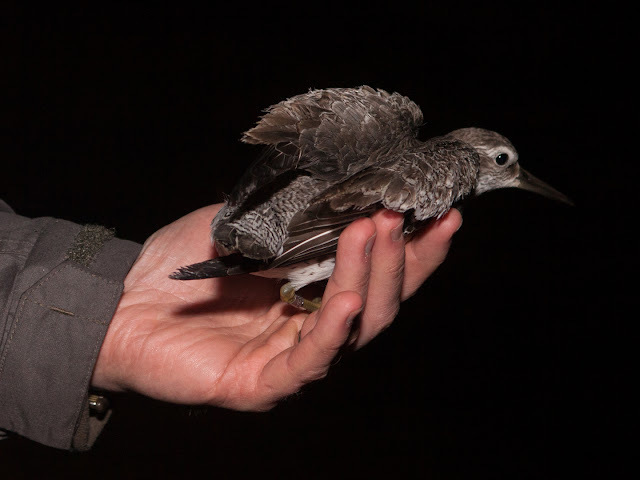 I'm sure the Knot isn't being as effected by our chance encounter in the same way I am, and I am starting to feel a little self conscious about my sentimentality towards these birds, but they are brilliant and so different in the hand. I let it go hoping that someone somewhere will re-find it thus adding a little more data to the science of migration. There is room on this beach for science and sentiment. How would you feel if you held a little living piece of the world in your arms tonight?